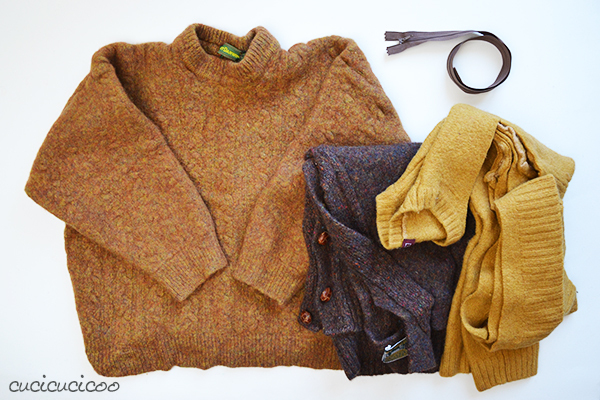 and, as already mentioned, how to felt wool sweaters. 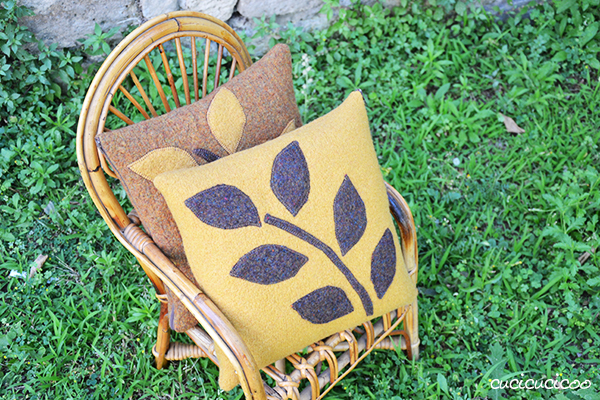 Because these are not any old covers, but felted wool pillow covers with a zipped closure and an appliqued leaf design! 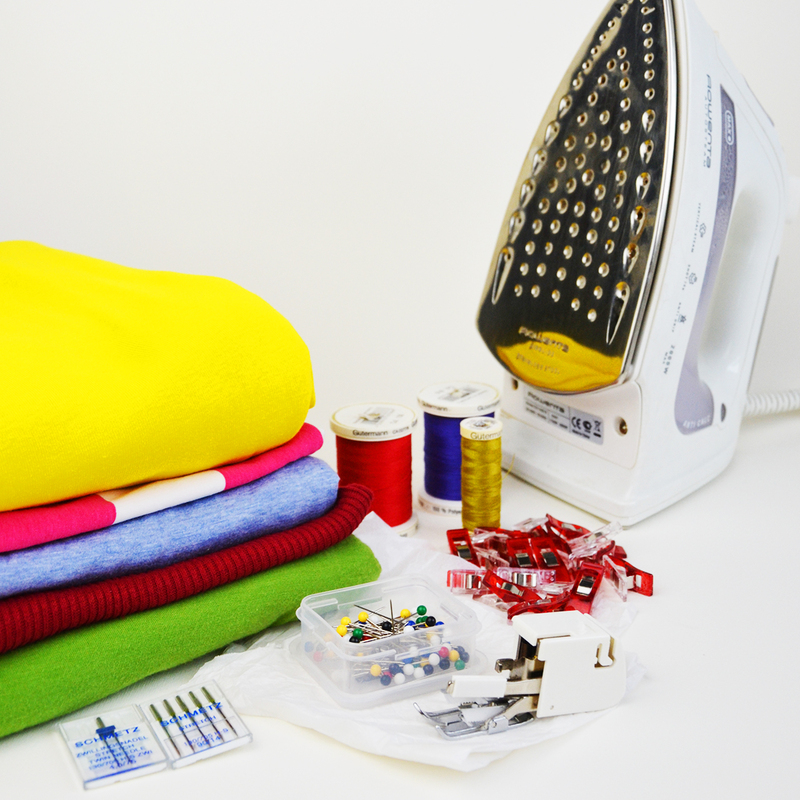 If you have old sweaters that you don’t need anymore, all you need to do is buy the zipper and a pillow insert, and you have a cool and inexpensive eco-friendly item for decorating your home or for giving away as gifts! 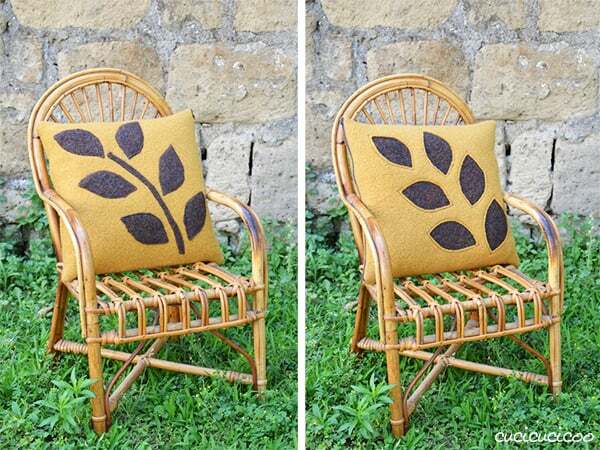 It’s hard to believe, but these simple materials can be quickly turned into these cool accent pillows! Let’s get started! 1. 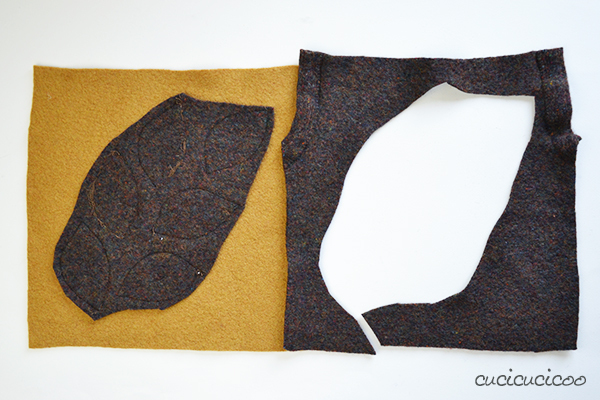 Cut out two 15 x 15″ (37.5 cm) squares from the sweater, one from the front and one from the back. Because even the largest mens’ wool sweater becomes pretty small once it’s been machine felted, you can only make a smallish throw pillow cover from it. 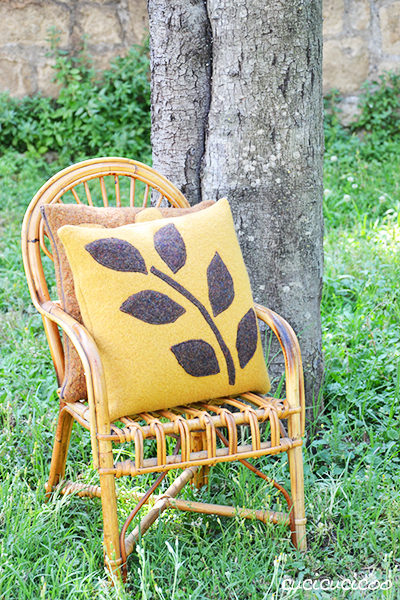 If you’d like to make a larger pillow, or if you don’t have any felted sweaters that are large enough, you could always sew together pieces of felted wool to get to the size you need. 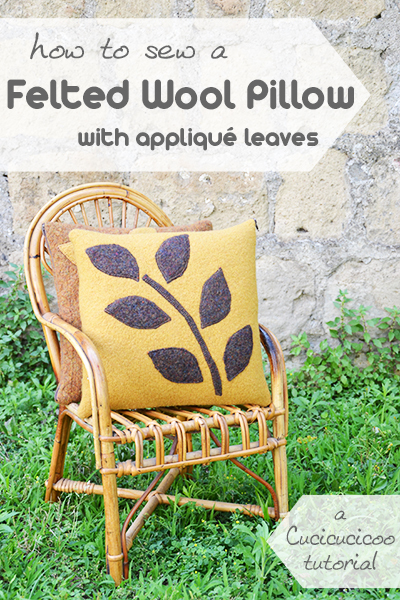 The pillow cover will be easier to sew together if you use felted wool that isn’t excessively thick. 2. 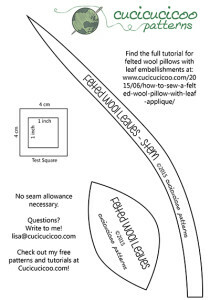 Download my leaf and stem template from my free download page and print it without scaling, otherwise make your own appliqué template in whatever shape you prefer. 3. 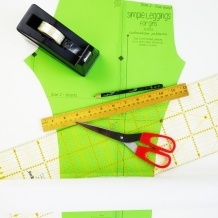 Cut out the appliqué pieces using the template and pin them on to the squares. The decoration should stay at least 1″ (2.5 cm) from the edges of your squares. Normally, when you appliqué, it’s best to use an iron-on adhesive to keep the pieces in place (as described here). That’s not necessary with felted wool because the rough surface keeps the pieces from moving around. In any case, the adhesive has a hard time sticking to rough fabric. 4. Test out some different appliqué stitches on scraps of the felted wool that you’ve used to decide which stitch, stitch length and stitch width you prefer. 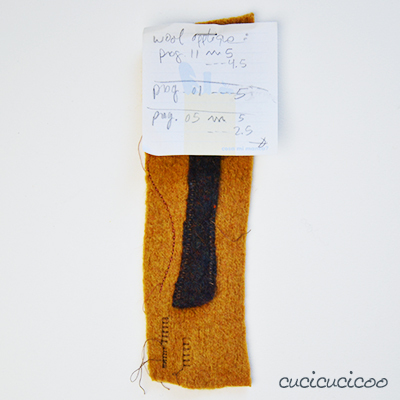 Write down your preferences on a piece of paper, staple it to the wool scraps, and put this sample piece aside for future reference. Use the 90/14 needle for sewing the appliqué. 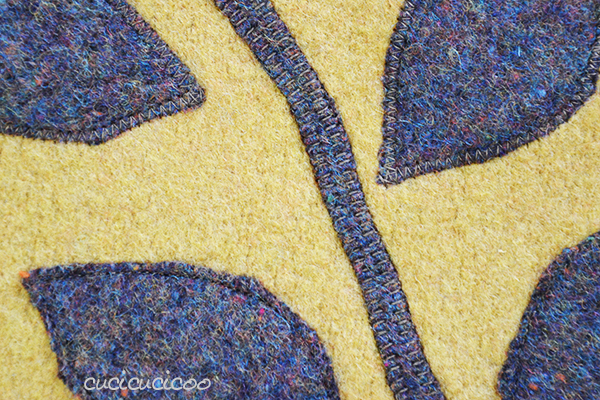 Here you can see what appliqued felted wool with a zig zag stitch (top leaves), a blanket stitch (stem) and a straight stitch (bottom leaves) looks like. (More on appliqueing with these stitches here.) 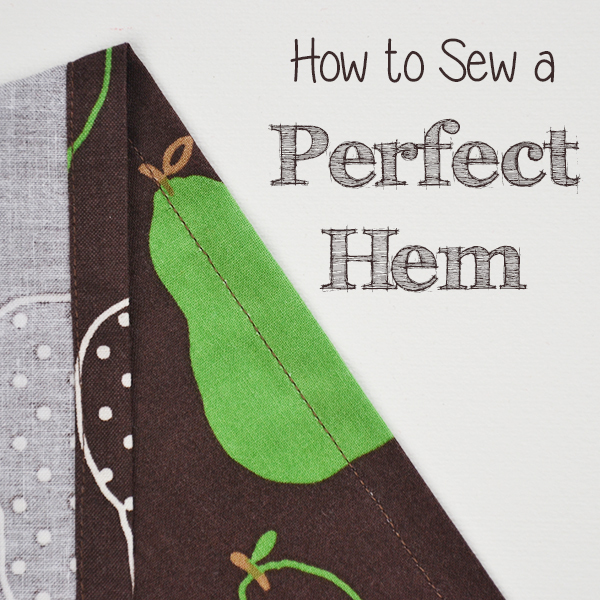 You can use a straight stitch because felted wool doesn’t fray. 5. 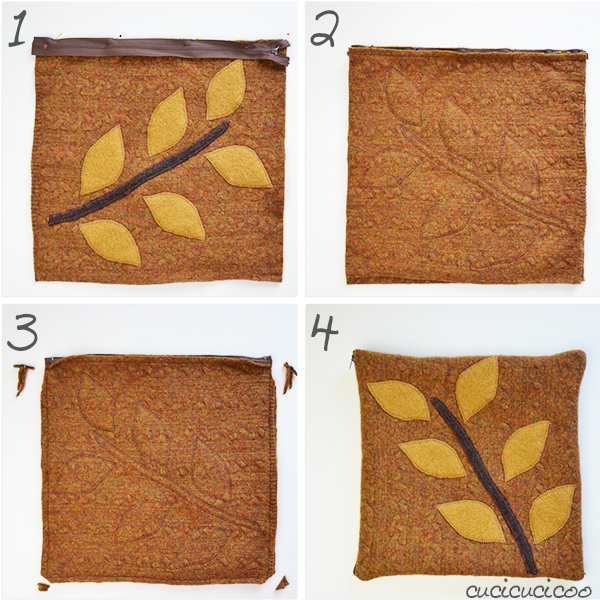 Sew the appliqué pieces onto both wool squares. I made two pillows, so I had a total of four squares. 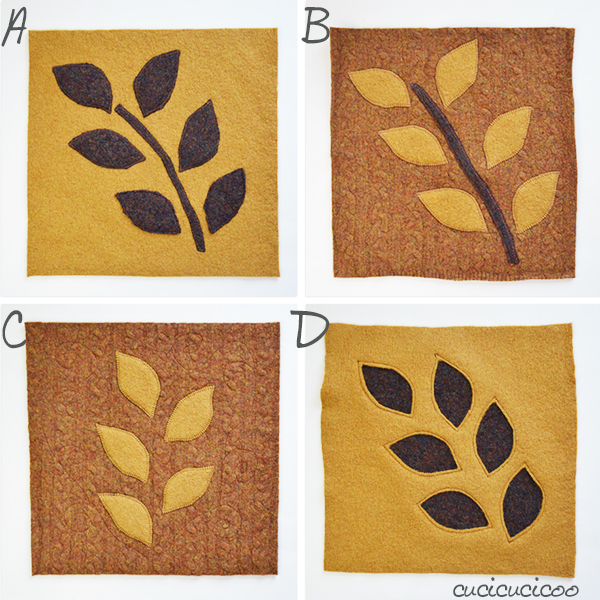 I used classic appliqué for squares A, B and C and reverse appliqué for square D. I also sewed some vine-like swirls onto the background of square C, which is a nice effect, even though it gets lost on the textured wool background. If you decide to do that, make sure to use a plain wool without cables or ribbing. 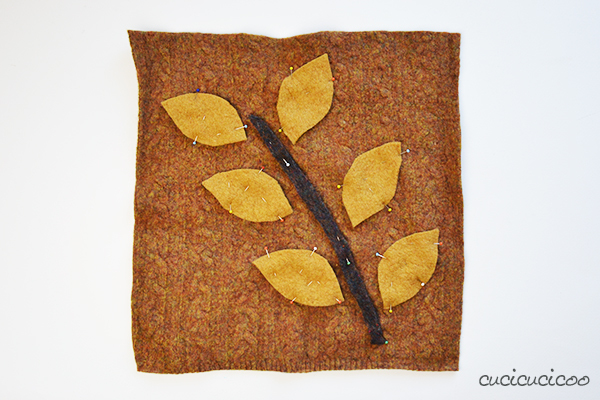 To do the reverse appliquè, I pinned two squares of felted wool together, traced the leaf shapes onto the top layer, sewed along the lines, and cut out the top layer inside the stitching, thereby exposing the bottom layer. I then trimmed off the excess fabric from the bottom layer to reduce bulk (and to use for other appliquéd shapes). I love reverse appliqué and you can see other examples of it here, here, here and here. Great! Your squares are all ready for being assembled into pillow covers! 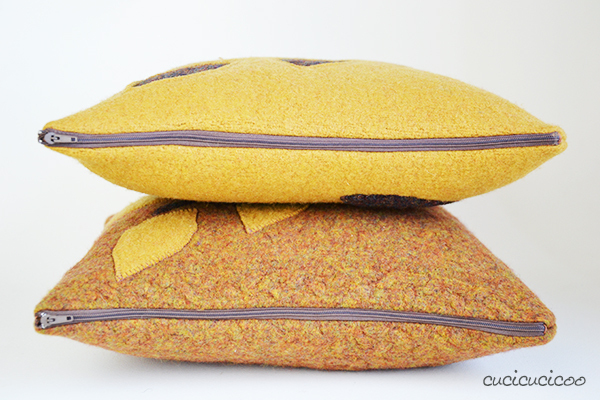 I’ve already described the process in the tutorial for a simple zipper pouch, but I want to give you some extra tips to deal with sewing the bulky boiled wool. 1. Place one wool square right side up with the side you want to sew the zipper to on top. I wanted the zipper on the side of the pillow, not the top where it would be more visible, so I turned the square with its left side on top. Line up the edge of the zipper tape with the square edge, wrong side up. 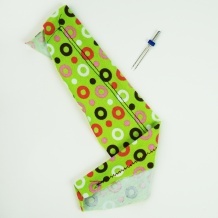 (I used the zipper from my mini-tutorial on how to shorten a zipper.) Pin and sew with a zipper foot as described here. 2. Place the other wool square right side up with the side for the zipper on top. If you are sewing a side zipper, as I did, remember that you need to sew the zipper to the other side of the square. I sewed it to the left side of my first square, so the right side of my second square. Position the other side of the zipper tape, wrong side up, along the square edge, pin and sew. You will know that you have lined the pieces up with the zipper properly if the squares are exactly one on top of the other, right sides facing. Do NOT topstitch! I always topstitch when installing zippers to keep the seam allowances from getting caught in the zipper teeth, but the felted wool is very thick so it’s not easy to do this with a zipper foot. In any case, the zipper will not be continually opened and closed and the pillow form fills out the zipper area so that it looks nice. 3. Pin down the two sides, then stick your hand inside and unzip the zipper about 2/3 of the way. Then pin the third side and sew all around with a 110/18 needle. I like to use a walking foot for this part because the layers of boiled wool are very thick, especially in the areas with the zipper tape. I suggest passing back over these areas multiple times to strengthen it. This is the hardest part of this project, so don’t get discouraged if it doesn’t go smoothly. Like I already mentioned, it will be much easier to sew if using a thinner felted wool as opposed to a very bulky one. Clip the two bottom corners (more on clipping and notching here) and trim the seam allowance in the zipper area (as seen in picture #3) to reduce bulk. 4. 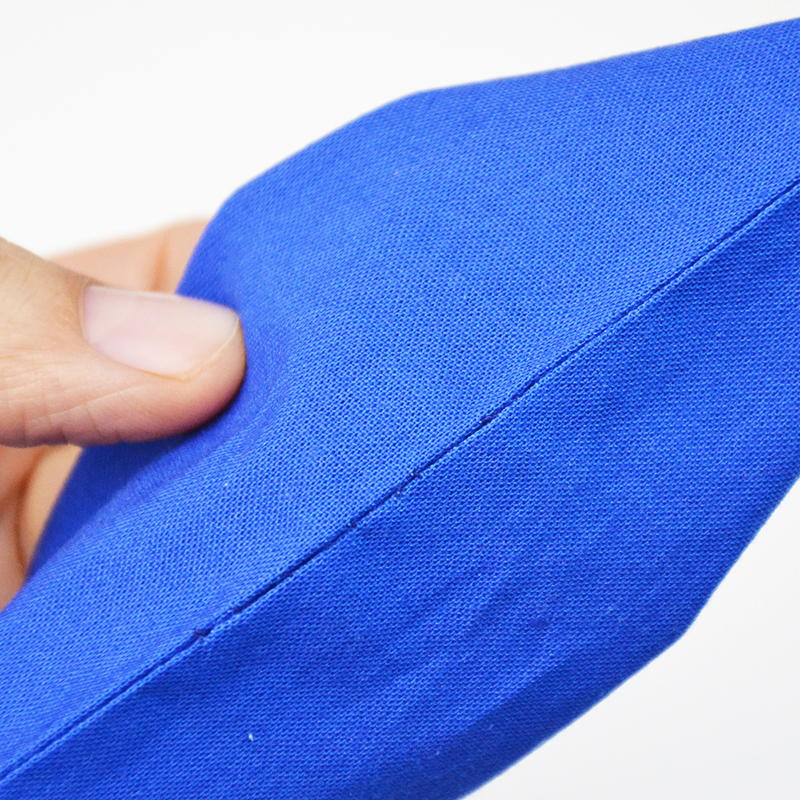 Turn the pillow cover right side out through the unzipped zipper, poke out the corners and zip it up without catching the seam allowances, and you’re done! …and the front and back of the second pillow, which I prefer. The zipper makes for it easy to remove the pillow cover for washing, and the zipper area looks great even without topstitching. A perfect touch of home decor for the autumn or winter, a lovely decoration for a cozy covered porch or a great gift! And you also have the peace of mind knowing that you’ve helped the environment by reusing something that would’ve been otherwise discarded! 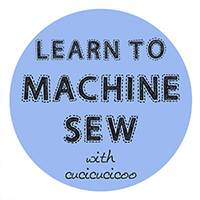 This tutorial on how to sew a felted wool pillow with leaf appliqué is part of the syllabus of Cucicucicoo’s beginner’s sewing course! 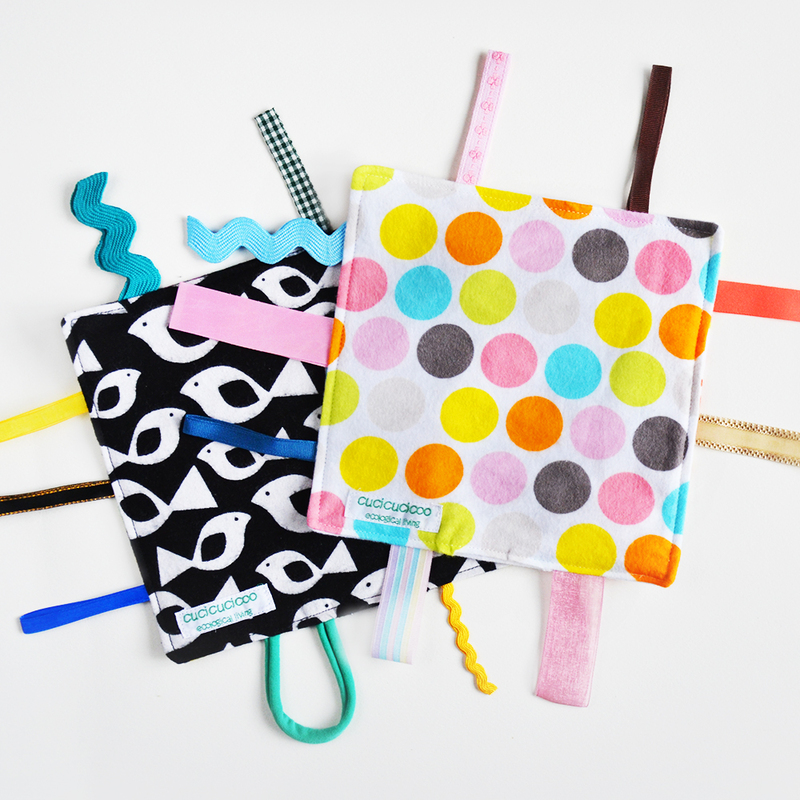 Don’t forget to share pictures of your pouches (and what you put in them!) on the Cucicucicoo Creations Flickr Group or the Cucicucicoo Facebook page! Question of the day: My timing is decidedly off with this project, at least for the Northern Hemisphere that just had its first day of summer yesterday! Believe it or not, I actually meant to publish this tutorial months ago, but it kept getting put off for one reason or another. Are there any specific summer-related projects you’d like for me to create a tutorial for? I do have a bunch of great summer projects done and photographed, so I just need to find the time to edit the photos and write up the tutorials. 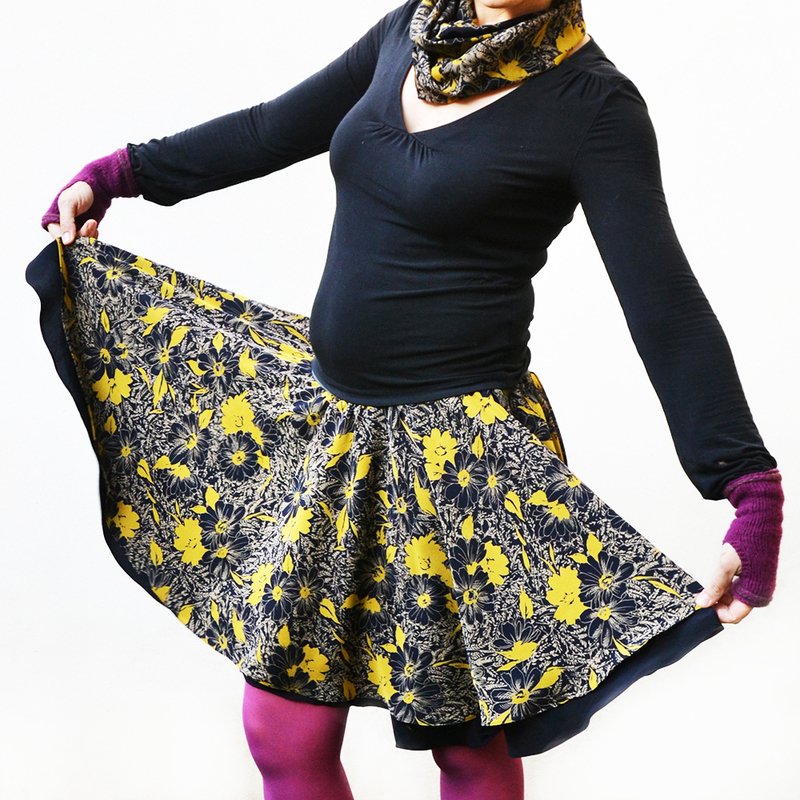 I have some clothing tutorials for both girls and women, and some refreshing summer food tutorials, too! What are you more interested in reading about first? Grazie mille del bellissimo tutorial! Complimenti! I cuscini sono bellissimi! Purtroppo al momento non ho niente da infeltrire, aspetterò. 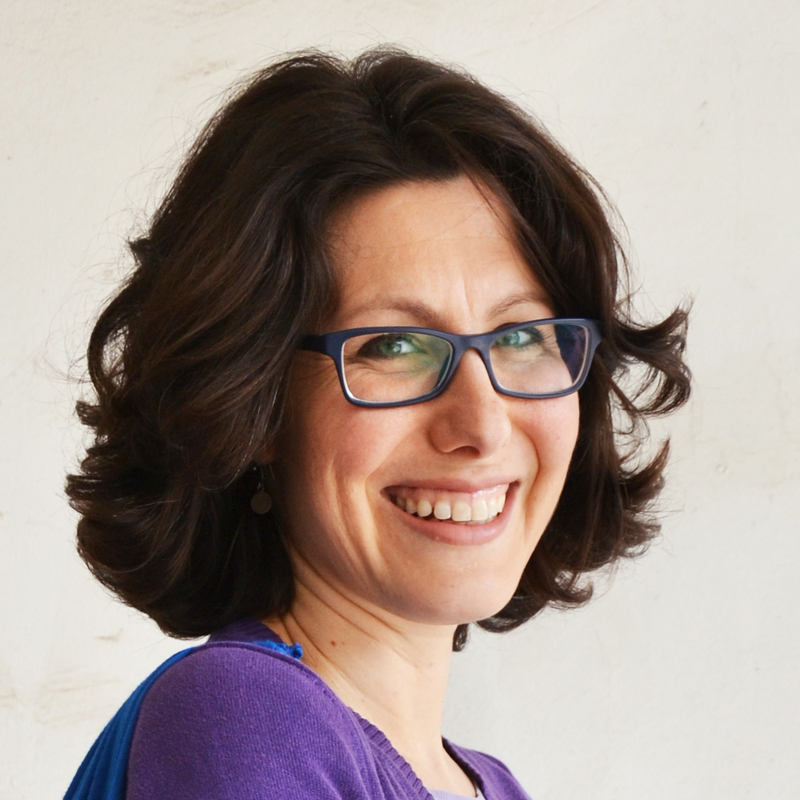 Con un avanzi di lana infeltrita ho fatto dei quadratini e li uso per mettere il tonico per il viso. Vanno molto bene e poi basta lavarli e si possono riutilizzare. Grazie per i tuoi splendidi tutorial, sei veramente bravissima. 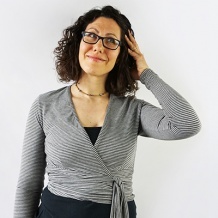 Grazie, Rosy! è un’ottima idea usare quadratini di lana infeltrita per il viso! (Io ho fatto qualche cerchietto di spugna da usare così.) Sicuramente prima o poi ti capiterà qualche maglione da usare, altrimenti c’è sempre il mercato dell’usato! I’ve felted plenty of woollen jumpers over the years. Still have some of them. Your cushions are beautiful, Lisa. I’ve featured them today. Thank you, Pam! Yes, I have a huge collection of felted wool sweaters… some done on purpose and others not! 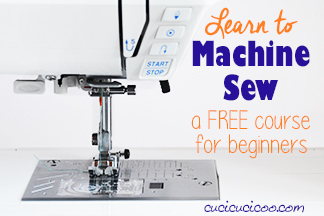 They’re so much fun to cut into and sew up! 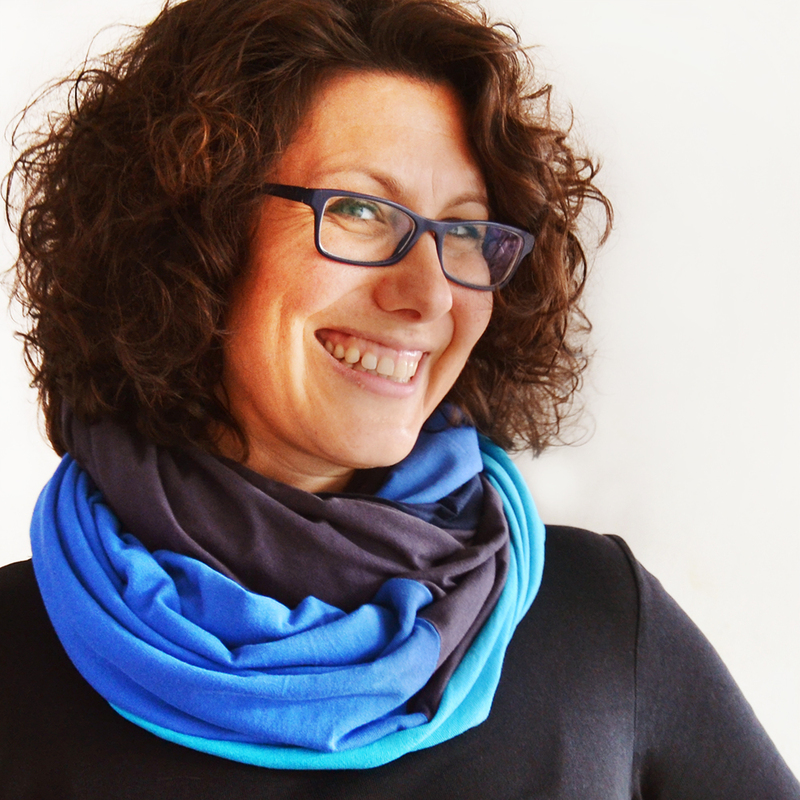 A great project – I’ve been meaning to try felting for a long time, so this is going on my to-make list. I also had to say how delighted I was to see that little wicker chair – I have the exact same one, from my own childhood, in my house! My kids love sitting in it and it’s so amazing to see another one!! That is so funny, Cheryl! That chair was a hand-me-down from a friend, so I really have no idea how old it is or where it came from, but my kids loved it! Anyway, you should try felting. It’s so much fun and a lot of fun to cut into those felted sweaters! Oh these are absolutely beautiful!! 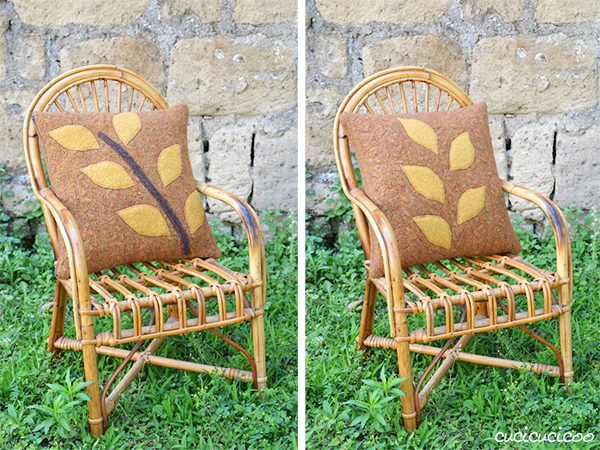 I love recycle projects with old clothes and these pillows are just wonderful! Thank you for the detailed tutorial! I just published your post! Love these pillows. SO creative and thank you so much for sharing them with us!